There are a number of designs and types of lathe intended for use by watchmakers, some dating back to the late 1700s and including specialised models - for example "fiddle" lathes, "steel turns", Jacot, Swiss, Swiss Universal (also called the English Mandrel) Bottum and Dracip. However, more modern examples can generally be divided into two groups - the lighter "Geneva" and heavier "WW". The "Geneva" can be recognised by its round bed, with a flat machined along either the top (or, more commonly, the back) and nearly always supported on a single foot beneath the headstock. 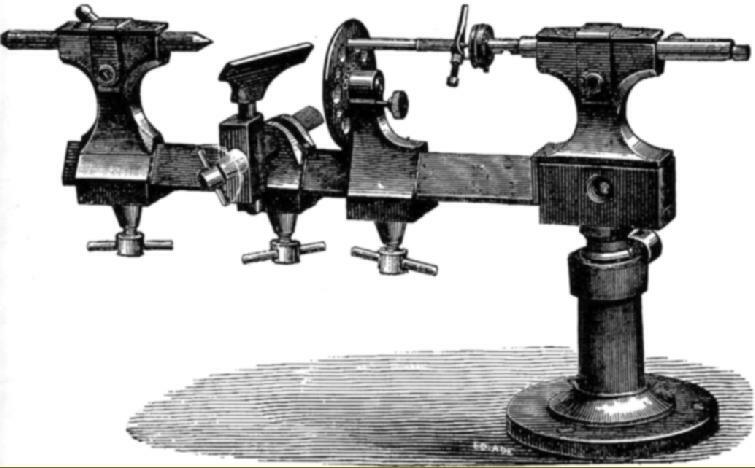 These lathes, invented in 1859 by Charles S. Moseley in the U.S.A., generally take 6, 6.5 or 8 mm collets and were designed for lighter, very high-precision work. However, the "WW" (Webster-Whitcombe), is considered by many to be the more versatile of the two - and hence the more popular. Also American in origin, the WW dates from around 1889 and usually has a centre height, in standard form, of exactly 50 mm - though very occasionally 65, 70 mm and other figures are encountered. Of heavy construction, the bed is formed with a 37 mm-wide flat on the top, a 60-degree bevel along each edge and carries a headstock fitted with a spindle to accept 8, 10 mm or 12 mm collets (though odd, in-between sizes have also been discovered). Of all the very many types and models made, experienced users of these lathes generally concur that amongst the very best in terms of quality and usability are those WW models fitted with ball-bearing spindles made by the American companies Levin and Derbyshire. The lathes are robust yet not oversize, made to the strictest standards and are able to run continuously at very high speeds with absolute reliability and also, if necessary take deep cuts. 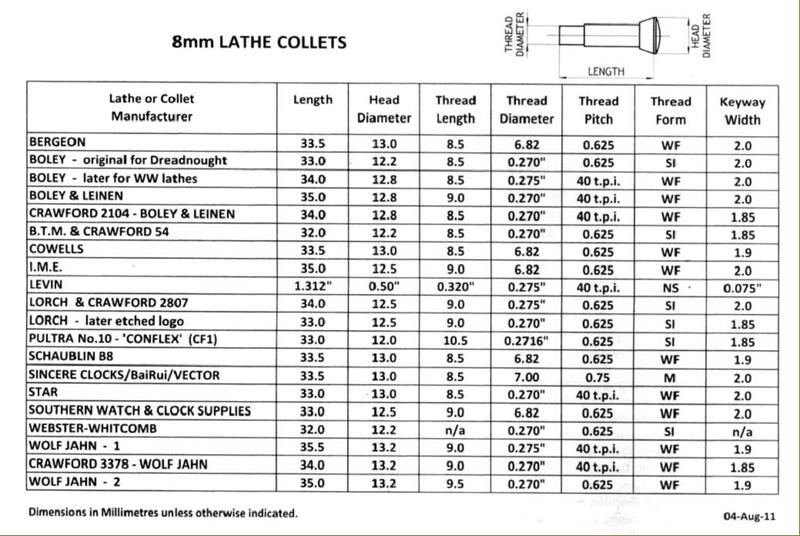 However, many users are certain that lathes with plain "cone" bearings can, when correctly set up, perform just as well - hence, when buying a used lathe, the choice often comes down to not the particular make, or specification, but balancing condition, the range of accessories included and, of course, the price. Amongst exceptions to the Geneva and WW types, are a number of unusual and interesting machines including a range of fine Boley lathes, manufactured from the middle 1800s to the early 1900s with either a triangular-form bed or an oddly compromise design (which did not catch on) where the bottom of the bed was semi-circular in form and the top triangulated or "bevelled" . Also available have been slightly larger lathes with triangular-beds such as Glashutte, H.Strube & Fils together with unknown makes from the former East Germany and, though they might be considered as being too large, an unknown model from France and the Dalgety. 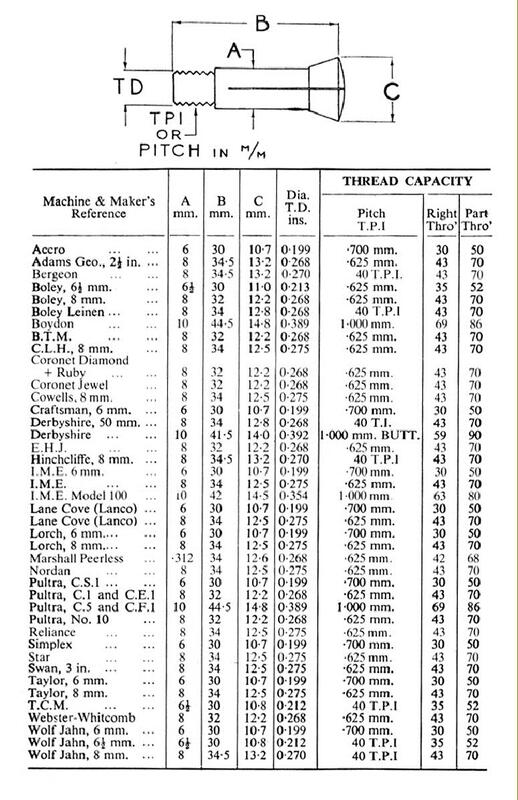 Larger than the WW type are what might be called "toolmakers' or "bench precision" lathes: these vary in size from the Schaublin 65 and 70 (the latter types being the most popular and frequently-encountered machine in the professional watchmaker's workshop), the Pultra 15/90 and larger examples such as the Schaublin 102, American Watch Tool Company, Arrow, B.C.Ames, Bausch & Lomb, Benson, Boley, Bottum, Boxford, B.W.C., Carstens, Cataract, Cromwell, Crystal Lakes, CVA, Derbyshire, Elgin, Hardinge, Hjorth, Juvenia, Karger, Leinen, Levin, Lorch, Mikron, W.H.Nichols, Potter, Pratt & Whitney, Rambold, Rebmann, Remington, Rivett, Saupe, See (FSB), Sloan & Chace, Smart & Brown, T & L.M., U.N.D., Van Norman, Wade, Waltham Machine Works, Weisser, Wolf Jahn and (though now very rare), Frederick Pearce, Ballou & Whitcombe, Sawyer Watch Tool Co., Engineering Appliances, Fenn-Sadler and the "Cosa Corporation of New York." While useful machines in a precision workshop, these are outside the scope of this article but further information can be found here. Not only have there been many genuine makers of lathes for watchmakers, but also a lot of "badge engineering" where dealers and distributors commissioned batches of lathes for themselves - a well-known example from England being George Adams of London (who sold and re-branded mainly German-made machines) and G.Boley who offered their "bevelled-bed" model for re-badging by importers - two examples of this being the "English" Rawco and Telco. This situation was compounded by a number of parts and accessories being interchangeable between different makers - so it is entirely possible that a lathe has been "made up" from others, either casually over many years of ownership, or unscrupulously by a "dealer". However, it's very unlikely that the bed, headstock and tailstock will be from different manufacturers, but if they are, be wary. In addition to known and recognised makers, a surprising number of watch lathes have been discovered bereft of any identification. Quite often, just a single example is found, examples being this interesting "portable" type, three unknown from the former East Germany and some with odd design features or a strange mix of specification quite at odds with more conventional types. Unfortunately no maker of a watch lathes has ever offered a proper handbook for their products but, happily, there is an excellent hard-back book available that does the same job: "The Watchmakers' Lathe". This is a long-established publication and, because most of these lathes were built along the same lines, and use almost identical accessories, the book is able to give instructions and guidance that applies to all types. 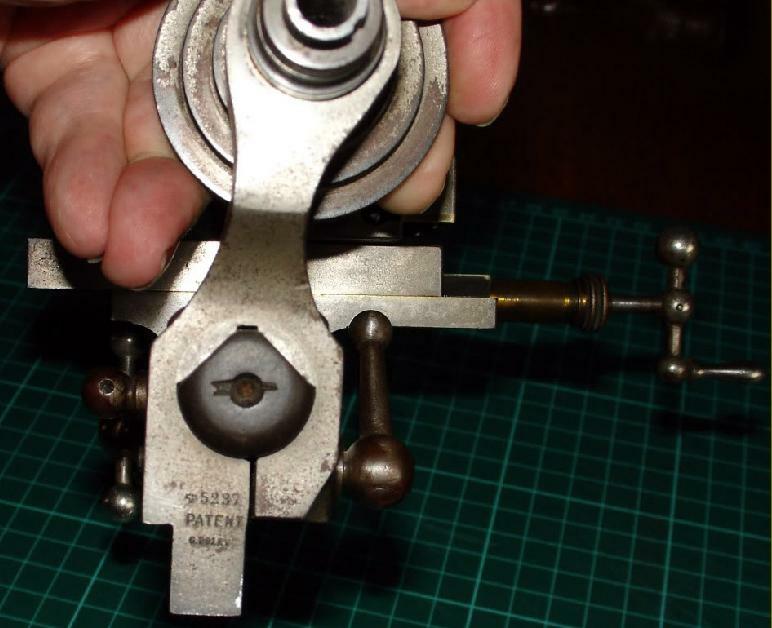 Below is a set of links in the lathes.co.uk Machine Tool Archive to some makers of watch and instrument makers' lathes and their accessories - some common, like G.Boley and lorch but others very rare, e.g. Accuro, Froidevaux., O.W.T. and Reese. R.H. St. John ((USA) - actually a specialised "dental lathe"
Lancaster Special (by the Faneuil Watch Tool Company circa 1899 for sale by a jewellers' supply house L. C. Reisner of Lancaster, Pennsylvania. An early American-made Moseley lathe of the "WW" type with parts as annotated by the maker. Not a design that caught on: the unusual Boley with a semi-circular base to the bed and a triangulated top. An English-made BTM "Geneva" pattern watchmakers' lathe (note the bar-like bed with, in this case, a flat at the back) complete in its maker's fitted wooden box with a range of useful accessories. The item top left in the box is that most valuable of extras - a compound rest, used to hold a cutting tool manipulated under the control of screw-feed slides. Boley Lathe No. 1b. A "WW" pattern lathe of a heavier pattern, admitting 230 mm between centres, and with feet at both end of the bed. On this model the compound slide was fitted as part of the standard equipment. Another Boley but this time equipped for production work with quick-action levers fitted to the collet closer, compound slide and tailstock. The tailstock also has an indexing 6-station toolholder and the cross slide toolposts at front and back. A later type of Boley & Leinen "Reform" lathe, manufactured from the early 1950s. The mouth-watering outfit was listed as the No. 77/X1V and contains virtually everything a skilled watch-repair man could wish for including, top left, a second headstock fitted with a permanently mounted (and hence very accurately aligned) faceplate with three clamps. Watchmakers" or Instrument-makers' lathes can be very valuable, especially if they are in fine, original condition and complete with lots of accessories. Buying just a basic lathe with bed, headstock tailstock and T-type tool rest can be false economy - there are lots of these about, at attractively low prices, but the real value is in the extras that allow the lathe to be used as a miniature "machining centre" - as originally intended - to cut, for example, wheels (gears), mill small parts and hold tiny, awkwardly shaped mechanisms for repair and restoration. Because there is considerable competition for accessories, if your basic lathe has to be equipped one part at a time much time, effort and money will be expended - hence, if you can, find a fully-equipped lathe; this will be a much better investment and a lot easier for you, or your heirs, to sell. Wheel-cutting attachment with division plate (to cut what the laymen would call cogs or gears but which are known to the watchmaker as "wheels"). Unfortunately no maker of a watch lathes has ever offered a proper handbook for their products but, happily, there is an excellent hard-back book available that does the same job: "The Watchmakers' Lathe". This is a long-established publication and, because most of these lathes were built along the same lines, and use almost identical accessories, the book is able to give precise instructions that apply to all types. A Swiss-made Bergeon Model C of the "Geneva" type. This example is fitted with a compound slide rest to hold the cutting tool, a lever-action tailstock and, to assist with very small work, a magnifying glass held on an articulated arm. Bergeon is the only indigenous Swiss manufacture of watchmakers' lathes to have survived into the 21st century.